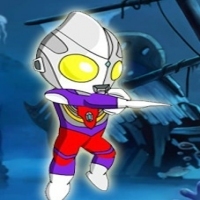 Description Ultraman had notice that appeared a batch of mutated zombies in the Sea Floor, and Ultraman need go deeply into their territory to eliminate them and get sea world's purity back. But he will be affected by Mutant Zombies with the relentless attacks. Let's go and have a look who can win the battle.